Thank you for joining me as we count down to the next MFT release. We are two days away from the big day! All the new Stamps, Die-namics, and Stencils will be available on Tuesday, July 8th at 10:00pm EST. Be sure to check out the MFT Blog to see all the new items being revealed today. Don't forget to leave a comment on the MFT Blog Countdown posts, YOU could win one of the seven $75.00 gift voucher. I have two cards to share with you today featuring the new Bring on the Cake Die-namics and Delicious Birthday stamp set. These two products are my absolute favourite items from this release! 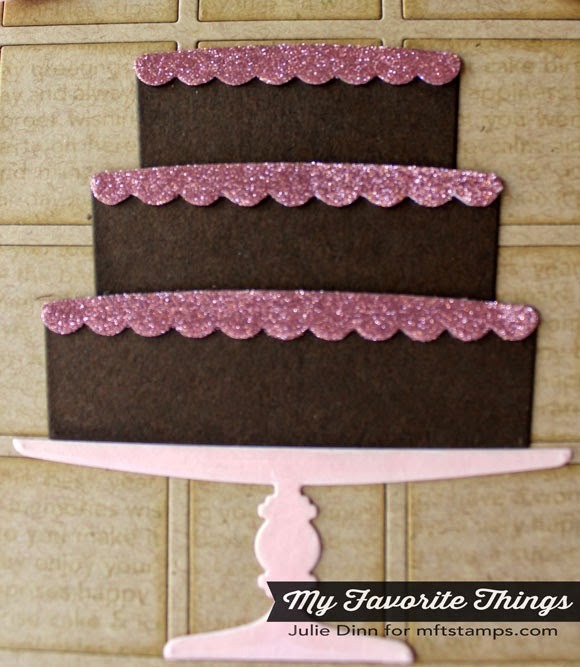 For the first card I created a chocolate cake with pink, sparking icing. Yummy! I die-cut the cake in Chocolate Brown card stock. For the icing I used my favourite trick for adding glitter to a project. I added a piece of Scor-Tape to a piece of Pink Lemonade card stock and then I die-cut it with the icing die. I adhered the icing to the cake and then I removed the backing from the Scor-Tape. I applied the glitter directly on the Scor-Tape. The glitter sticks wonderfully to the tape. 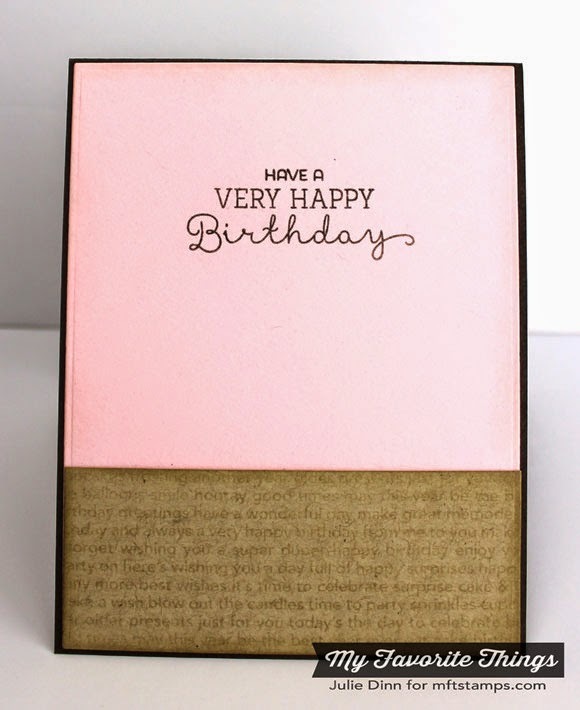 For the background of the card, I stamped a piece of Kraft card stock with the new Happy Birthday Background and I embossed it with the Square Grid Cover-Up Die-namics. The sentiment from the Delicious Birthday stamp set was stamped on a Dimensional Banner. For my second card, I decided to create a wedding cake instead of a birthday cake. This set is so versatile, the swag icing is perfect for wedding cakes! I die-cut the cake in Smooth White card stock, the swag icing in Berrylicious card stock. I added a little bling to finish off the cake. 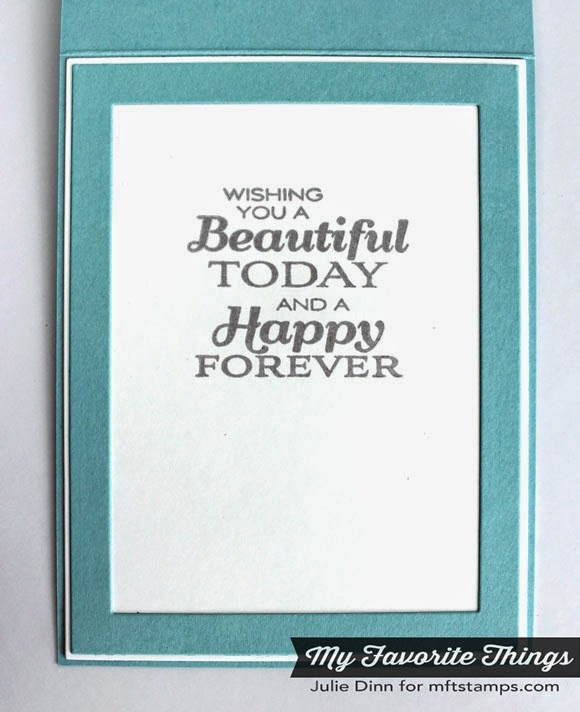 On the inside of the card, I added a sentiment from the Together Forever stamp set that was released last month. Thanks so much for joining me today. Be sure to check out the MFT Blog to see all the amazing creating the design team has to share with you today. 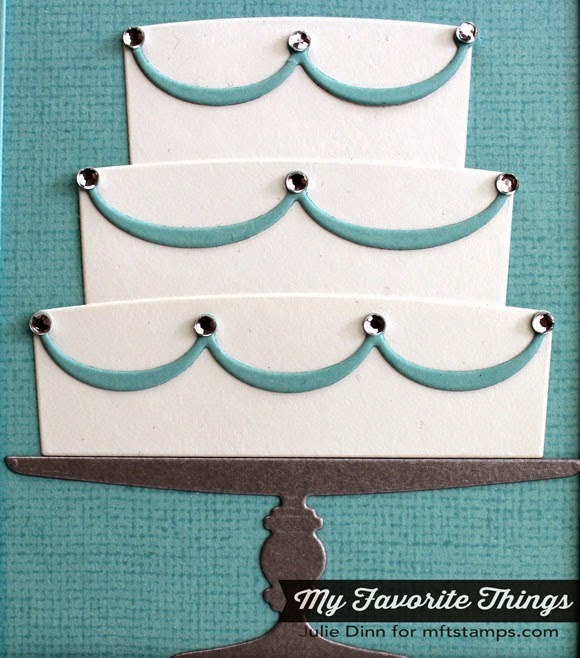 Loving your cake cards! Makes the set look SO versatile - birthday AND wedding! Love it! So pretty!! Love the colors and ideas. Love the glitter on the icing, Thanks for the score tape tip. Great cards....love both of them! Great cards!! Love the framing on the second card!! Ho your card are so lovely, my fav was the blue one! What a beautiful card, Julie!!! Very pretty cards. I especially like the bride and groom card, it looks super. Thanks for sharing. I'm going to need these cards for my brother's upcoming wedding. They are both Beautiful. Beautiful cards! 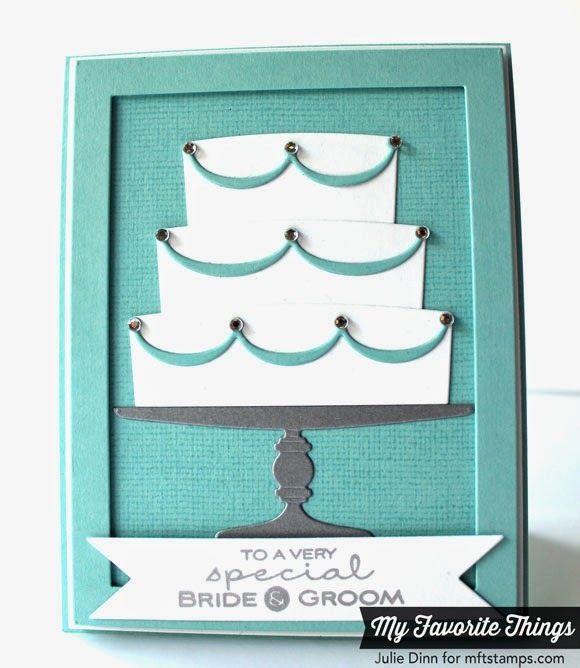 That cake die is so perfect for wedding cards! Awe I LOVE the wedding card, it's so elegant!